If you like the Keymoment you will love its unplugged little brother. As its name implies, Keymoment unplugged is an unplugged version of the Keymoment. Basically, the concept remains the same. In order to increase your physical activity you can make many things. You can become a member in a fitness center, go for a jog or buy a dog. All these activities will help you to become more active. Unfortunately this is easier said than done. Most of these activities are time-consuming, need an extra portion of self-control and should be integrated in your daily life by yourself. The WHO recommends including 150 minutes of moderate-intensity aerobic physical activity (e.g. walking or cycling) throughout the week to insure a healthy lifestyle. Moreover they identified commuting to work as a potential area to include this suggestion. However, there are hundreds of other routes you could manage by walking or cycling (e.g. to the supermarket around the corner or to the city center that is crowded by cars anyway). Finally daily transport (predominantly done by car) is in general a potential area to reduce CO2 emission. And to kill two birds with one stone, the Keymoment draws on these simple plans to achieve your goal. The unplugged version of the Keymoment has two hooks. 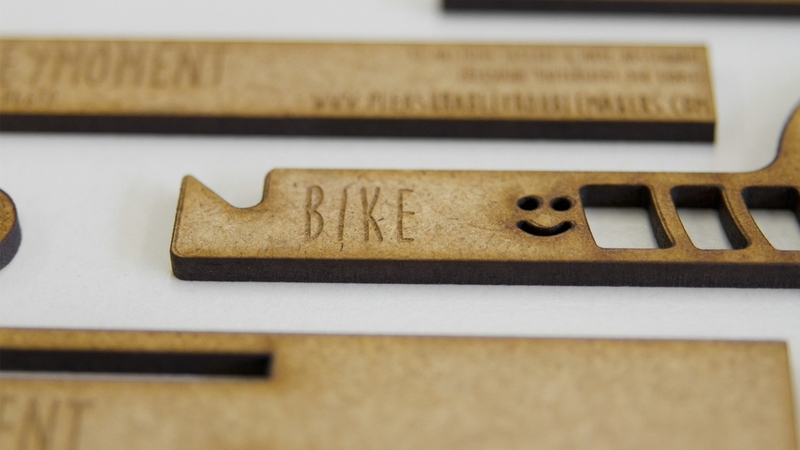 One is for your bike key and one is for your car key. This already hints a potential choice you have to make every time you want to go somewhere (whether by car or by bike). If you take the bike key nothing much happens. You are on a good way to meet your goal. But if you take the car key, the little seesaw twists and chucks the car key to the ground. Most likely you will pick it up. Picking up the key means picking up your intention to take the bike more often. It is up to you. Keymoment creates a carefully designed, quite tangible moment of choice. A free choice you have to make. You do not have to explain yourself. However, we know that this choice also creates friction – damn Troublemaker. But Keymoment unplugged also eases the situation through a number of features – the pleasurable part. First of all, the bike key can always be put back on its hook. As in the original concepts, both keys could be still placed on top of the box to circumvent the choice for a while. The “top secret” feature is hidden in the way you take the car key. Fast and nonreflective will lead to the above-mentioned situation. Take it slowly and with caution and you will see that you can also cheat the system (but you can never cheat yourself). Mum’s the world! 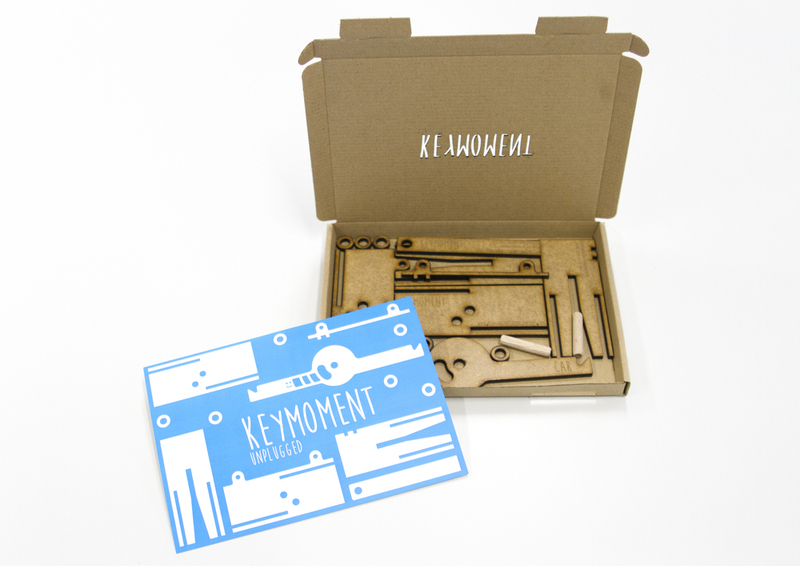 Keymoment unplugged consists of a several laser cut components that are put together. Once it is wall-mounted you can start to challenge yourself.